1.1 Examples of Multiconductor Transmission-Line Structures. 1.2 Properties of the Transverse ElectroMagnetic (TEM) Mode of Propagation. 1.3 The Transmission-Line Equations: a Preview. 1.3.1 Unique Definition of Voltage and Current for the TEM Mode of Propagation. 1.3.2 Defining the Per-Unit-Length Parameters. 1.3.3 Obtaining the Transmission-Line Equations from the Transverse Electromagnetic Field Equations. 1.3.4 Properties of the Per-Unit-Length Parameters. 1.4 Classification of Transmission Lines. 1.4.1 Uniform vs. Nonuniform Lines. 1.4.2 Homogeneous vs. Inhomogeneous Surrounding Media. 1.4.3 Lossless vs. Lossy Lines. 1.5 Restrictions on the Applicability of the Transmission-Line Equation Formulation. 1.5.1.1 The Infinite, Parallel-Plate Transmission Line. 1.5.1.2 The Coaxial Transmission Line. 1.5.2 Transmission-Line Currents vs. Antenna Currents. 1.6 The Time Domain vs. the Frequency Domain. 1.6.1 The Fourier Series and Transform. 1.6.2 Spectra and Bandwidth of Digital Waveforms. 1.6.3 Computing the Time-Domain Response of Transmission Lines Having Linear Terminations Using Fourier Methods and Superposition. Chapter 2: The Transmission-Line Equations for Two-Conductor Lines. 2.1 Derivation of the Transmission-Line Equations from the Integral Form of Maxwell's Equations. 2.2 Derivation of the Transmission-Line Equations from the Per-Unit-Length Equivalent Circuit. 2.3 Properties of the Per-Unit-Length Parameters. 2.4.1 Properties of the Frequency-Domain Per-Unit-Length Impedance and Admittance . Chapter 3: The Transmission-Line Equations for Multiconductor Lines. 3.1 Derivation of the Multiconductor Transmission-Line Equations from the Integral Form of Maxwell's Equations. 3.2 Derivation of the Multiconductor Transmission-Line Equations from the Per-Unit-Length Equivalent Circuit. 3.3 Summary of the MTL Equations. 3.5 Properties of the Per-Unit-Length Parameter Matrices L, C, G.
Chapter 4: The Per-Unit-Length Parameters for Two-Conductor Lines. 4.1 Definitions of the Per-Unit-Length Parameters l, c, and g.
4.2 Lines Having Conductors of Circular, Cylindrical Cross Section (Wires). 4.2.1 Fundamental Subproblems for Wires. 4.2.1.1 The Method of Images. 4.2.2 Per-Unit-Length Inductance and Capacitance for Wire-Type Lines. 4.2.3 Per-Unit-Length Conductance and Resistance for Wire-Type Lines. 4.3 Lines Having Conductors of Rectangular Cross Section (PCB Lands). 4.3.1 Per-Unit-Length Inductance and Capacitance for PCB-Type Lines. 4.3.2 Per-Unit-Length Conductance and Resistance for PCB-Type Lines. Chapter 5: The Per-Unit-Length Parameters for Multiconductor Lines. 5.1 Definitions of the Per-Unit-Length Parameter Matrices L, C, and G.
5.1.1 The Generalized Capacitance Matrix, . 5.2 Multiconductor Lines Having Conductors of Circular, Cylindrical Cross Section (Wires). 5.2.1 Wide-Separation Approximations for Wires in Homogeneous Media. 5.2.1.2 n Wires Above an Infinite, Perfectly-Conducting Plane. 5.2.1.3 n Wires Within a Perfectly-Conducting, Cylindrical Shield. 5.2.2 Numerical Methods for the General Case. 5.2.2.1 Applications to Inhomogeneous Dielectric Media. 5.2.3 Computed Results: Ribbon Cables. 5.3 Multiconductor Lines Having Conductors of Rectangular Cross Section. 5.3.1 Method of Moments (MoM) Techniques. 5.3.1.1 Applications to Printed Circuit Boards. 5.3.1.2 Applications to Coupled Microstrip Lines. 5.3.1.3 Applications to Coupled Striplines. Chapter 6: Frequency-Domain Analysis of Two-Conductor Lines. 6.1 The Transmission-Line Equations in the Frequency Domain. 6.2 The General Solution for Lossless Lines. 6.2.1 The Reflection Coefficient and Input Impedance. 6.2.2 Solutions for the Terminal Voltages and Currents. 6.2.3 The SPICE (PSPICE) Solution for Lossless Lines. 6.2.4 Voltage and Current as a Function of Position on the Line. 6.2.6 Power Flow on a Lossless Line. 6.3 The General Solution for Lossy Lines. 6.4 Lumped-Circuit Approximate Models of the Line. 6.5 Alternative Two-Port Representations of the Line. 6.5.2 Approximating Abruptly Nonuniform Lines with the Chain Parameter Matrix. 6.5.3 The Z and Y Parameters. 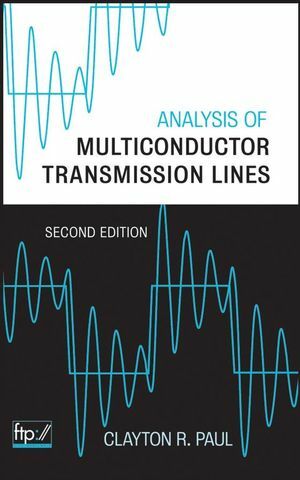 Chapter 7: Frequency-Domain Analysis of Multiconductor Lines. 7.1 The MTL Transmission-Line Equations in the Frequency Domain. 7.2 The General Solution for an (n+1)-Conductor Line. 7.2.1 Decoupling the MTL Equations by Similarity Transformations. 7.2.2 Solution for Line Categories. 7.2.2.1 Perfect Conductors in Lossy, Homogeneous Media. 7.2.2.2 Lossy Conductors in Lossy, Homogeneous Media. 7.2.2.3 Perfect Conductors in Lossless, Inhomogeneous Media. 7.2.2.4 The General Case: Lossy Conductors in Lossy, Inhomogeneous Media. 7.3 Incorporating the Terminal Conditions. 7.3.1 The Generalized Thevenin Equivalent. 7.3.2 The Generalized Norton Equivalent. 7.5.1 Analogy of the Frequency-Domain MTL Equations to State-Variable Equations. 7.5.2 Characterizing the Line as a 2n-Port with the Chain Parameter Matrix. 7.5.3 Properties of the Chain Parameter Matrix. 7.5.4 Approximating Nonuniform Lines with the Chain Parameter Matrix. 7.5.5 The Impedance and Admittance Parameter Matrix Characterizations. 7.6 Power Flow and the Reflection Coefficient Matrix. 7.7 Computed and Experimental Results. Chapter 8: Time-Domain Analysis of Two-Conductor Lines. 8.1 The Solution for Lossless Lines. 8.1.1 Wave Tracing and the Reflection Coefficients. 8.1.2 Series Solutions and the Difference Operator. 8.1.3 The Method of Characteristics and a Two-Port Model of the Line. 8.1.4 The SPICE (PSPICE) Solution for Lossless Lines. 8.1.5 The Laplace Transform Solution. 8.1.5.1 Lines with Capacitive and Inductive Loads. 8.1.6 Lumped-Circuit Approximate Models of the Line. 8.1.6.1 When is the Line Electrically Short in the Time Domain?. 8.1.7 The Time-Domain to Frequency-Domain (TDFD) Transformation Method. 8.1.8 The Finite-Difference, Time-Domain (FDTD) Method. 8.1.8.1 The Magic Time Step. 8.1.9 Matching for Signal Integrity. 8.1.9.1 When is Matching Not Required?. 8.1.9.2 Effects of Line Discontinuities. 8.2.1.1 Representing Losses in the Medium. 8.2.1.2 Representing Losses in the Conductors and Skin Effect. 8.2.1.3 Convolution with Frequency-Dependent Losses. 8.2.2 The Time-Domain to Frequency-Domain (TDFD) Transformation Method. 8.2.3 The Finite-Difference, Time-Domain (FDTD) Method. 8.2.3.3 Prony’s Method for Representing a Function. 8.2.3.5 An Example: A High-Loss Line. 8.2.3.6 A Correction for the FDTD Errors. 8.2.5 The Use of Macromodels in Modeling the Line. 8.2.6 Representing Frequency-Dependent Functions in the Time Domain Using Pade' Methods. Chapter 9: Time-Domain Analysis of Multiconductor Lines. 9.1 The Solution for Lossless Lines. 9.1.1 The Recursive Solution for MTLs. 9.1.2 Decoupling the MTL Equations. 9.1.2.1 Lossless Lines in Homogeneous Media. 9.1.2.2 Lossless Lines in Inhomogeneous Media. 9.1.2.3 Incorporating the Terminal Conditions via the SPICE Program. 9.1.4 The Time-Domain to Frequency-Domain (TDFD) Transformation Method. 9.1.5 The Finite-Difference, Time-Domain (FDTD) Method. 9.1.5.1 Including Dynamic and/or Nonlinear Terminations in the FDTD Analysis. 9.2.1 The Time-Domain to Frequency-Domain (TDFD) Transformation Method. 9.2.3 The Finite-Difference, Time-Domain (FDTD) Method. 9.2.4 Representation of the Lossy MTL with the Generalized Method of Characteristics. 9.2.5 Model Order Reduction (MOR) Methods. 9.2.5.1 Pade' Approximation of the Matrix Exponential. 9.2.5.2 Asymptotic Waveform Evaluation (AWE). 9.2.5.3 Complex Frequency Hopping (CFH). 9.2.5.4 Vector Fitting and MOR. 9.3 Computed and Experimental Results. Chapter 10: Literal (Symbolic) Solutions for Three-Conductor Lines. 10.1 The Literal, Frequency-Domain Solution for a Homogeneous Medium. 10.1.1 Inductive and Capacitive Coupling. 10.2 The Literal, Time-Domain Solution for a Homogeneous Medium. 10.2.3 Inductive and Capacitive Coupling. 10.3 Computed and Experimental Results. 10.3.1 A Three-Wire Ribbon Cable. 10.3.2 A Three-Conductor Printed Circuit Board. Chapter 11: Incident Field Excitation of Two-Conductor Lines. 11.1 Derivation of the Transmission-Line Equations for Incident-Field Excitation. 11.1.1 Equivalence of Source Representations. 11.2.1 Solution of the Transmission-Line Equations. 11.2.2 Simplified Forms of the Excitations. 11.2.3 Incorporating the Line Terminations. 11.2.4 Uniform Plane-Wave Excitation of the Line. 11.2.4.2 One Conductor Above a Ground Plane. 11.2.5 Comparison With Predictions of the Method of Moments. 11.3.1 The Laplace Transform Solution. 11.3.2 Uniform Plane-Wave Excitation of the Line. 11.3.3 A SPICE Equivalent Circuit. 11.3.4 The Time-Domain to Frequency-Domain (TDFD) Transformation Method. 11.3.5 The Finite-Difference, Time-Domain (FDTD) Solution Method. Chapter 12: Incident Field Excitation of Multiconductor Lines. 12.1 Derivation of the MTL Equations for Incident-Field Excitation. 12.1.1 Equivalence of Source Representations. 12.2.1 Solution of the MTL Equations. 12.2.2 Simplified Forms of the Excitations. 12.2.3 Incorporating the Line Terminations. 12.2.3.1 Lossless Lines in Homogeneous Media. 12.2.5 Uniform Plane Wave Excitation of the Line. 12.3.1 Decoupling the MTL Equations. 12.3.2 A SPICE Equivalent Circuit. 12.3.4 The Time-Domain to Frequency-Domain (TDFD) Transformation. 12.3.5 The Finite-Difference, Time-Domain (FDTD) Solution Method. 13.1 Representation of Lossless Lines with the SPICE Model. 13.2 Representation with Lumped-Circuit Approximate Models. 13.3 Representation via the Admittance or Impedance 2n-Port Parameters. 13.4 Representation with the BLT Equations. 13.5 Direct, Time-Domain Solutions in terms of Traveling Waves. 13.6 A Summary of Methods for Analyzing Multiconductor Transmission Lines. Publications by the Author Concerning Transmission Lines. Appendix A. Description of Computer Software. A.1 Programs for Calculation of the Per-Unit-Length Parameters. A.1.1 Wide-Separation Approximations for Wires: WIDESEP.FOR. A.1.3 Printed Circuit Boards: PCB.FOR. A.1.4 Coupled Microstrip Structures: MSTRP.FOR. A.1.5 Coupled Stripline Structures: STRPLINE.FOR. A.3.1 Time-Domain to Frequency-Domain Transformation: TIMEFREQ.FOR. A.3.2 Branin’s Method Extended to Multiconductor Transmission Lines: BRANIN.FOR. A.3.3 Finite-Difference, Time-Domain Method: FINDIF.FOR. A.3.4 Finite-Difference, Time-Domain Method: FDTDLOSS.FOR. A.4 SPICE/PSPICE Subcircuit Generation Programs. A.4.1 General Solution, Lossless Lines: SPICEMTL.FOR. A.4.2 Lumped-Pi Circuit, Lossless Lines: SPICELPI.FOR. A.4.3 Inductive-Capacitive Coupling Model: SPICELC.FOR. A.5.2 SPICE/PSPICE Subcircuit Model: SPICEINC.FOR. A.5.3 Finite-Difference, Time-Domain Method: FDTDINC.FOR. Appendix B. A SPICE(PSPICE) Tutorial. B.1 Creating the SPICE or PSPICE Program.